The obvious solution to this was direct drive trainers, which are generally far superior to magnetic but the cost rises a lot. Last year saw a shift in this market with the launch of several new lower priced models including the new Wahoo KICKR Core (£699.99) and the Tacx Flux S(£549.00). 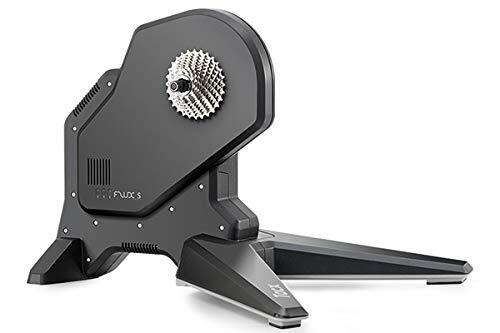 Both of these were still above my budget, but during Black Friday, Amazon briefly discounted the Tacx Flux S to £399.00 and I immediately snapped it up. At this price, it put it inline with many magnetic resistance trainers, and well below all other direct drive options. Even at £550 it is an excellent choice only being £100-£200 more than magnetic options. The model is essentially the same as the original Tacx Flux but the stand has been altered to allow for longer derailleur cages. The original Tacx Flux did have a lot of issues when first released but Tacx was proactive and updated the internals, so towards the end of its life it was trouble free and essentially the same as the new Flux S. When I originally bought this Halfords were doing the original model for £450 often discounted to £400, so if you can still find stock of that, it is well worth considering. BIKE COMPATIBILITY: 130 mm, MTB 135 mm. Adapters for other widths available. CASSETTE COMPATIBILITY: Shimano 9/10/11 speed, SRAM & Campagnolo 9/10/11 speed. As to the compatibility with Campagnolo, an adapter is required. CONNECTIONS: ANT+ FE-C compatible, Bluetooth, and Bluetooth FTMS. METRICS: Transmits power, speed, and cadence. APP COMPATIBILITY: The Flux S works with Zwift and TrainerRoad in Smart Bluetooth and ANT+ FEC. This is easier to set up than the Bkool, but there are additional things you need to buy to get you up and running. This does not include a cassette so you will need to buy something compatible which can add a significant chunk to the cost. I cheaped out and went with the cheapest 10-speed cassette that I could find on Amazon, even though I use an Ultegra cassette on my bike normally. If you plan to use this with a PC you ideally should buy an Ant+ stick. Tacx sell one but it is quite expensive. There are multiple alternative brands on Amazon, I use the Anself USB ANT+Stick but there is also one by Taope and one by CooSpo. Once you have the bits you need, the set up is straightforward, the trainer comes in two parts, you simply attach the stand to the trainer and use two hex screws to bolt it in place. The stand is fixed which makes it a little bulky to keep lying around, but its wide thick feet provide excellent stability during rides. Once you have set up all the hardware you are advised to use the Tacx app to update the firmware and run a calibration making sure the unit is as accurate as possible. Before you perform calibration, you should warm up the trainer for about 10 minutes. It is recommended to run the calibration every week or two, it only take a few seconds and I generally do it at the end of a ride so I don’t have to warm up the trainer. I used the Tacx Flux S with my main PC connected via Ant+ and via this method I experience almost no issues with connection or performance. On occasion, my PC would struggle to connect with the trainer and I would just need to unplug my Ant+ USB dongle and reconnect it, I suspect this is an issue with the dongle and my PC and not the trainer itself. The trainer can simulate 0%-10% inclines with a max 1,500 watts resistance with a +/- 3% accuracy. I am not a competitive cyclist, and to be quite honest I am a bit fairweather with outdoor cycling. However, I am quite fit, with at FTP of 320W and a peak power of 1,200w when tested on a WattBike, I wouldn’t be able to maintain that power for more than a second or two. So this should be more than adequate for 99% of cyclists. If you are competitive, I’d bet your budget is much higher than mine so this trainer is probably not a consideration in the first place. This trainer will suffer with high grades slopes at lower speeds and the Flux 2 will be superior in this regard, but there are always going to be some sacrifices buying the most affordable option. The road feel is much better than the Bkool, but still nothing like the real thing. I find my cadence is higher on trainers compared to outside, but this is more an issue with my style of training. Nearly all of my use with the Flux S was on Zwift, but the Tacx Training app for the mobile has plenty of training options including FTP tests, and GPS based rides with live opponents. The app is free to use for some of the basic settings but you need premium to use GPS maps, and live opponents. I almost exclusively used Ant+ for my rides, as the trainer is located in front of my main PC at the back of the room. However, you can use Bluetooth for the connection but with Zwift as far as I can tell they insist on you connecting to the mobile app and that acting like a bridge to the PC. I use this method to connect my Polar OH1 heart rate monitor, and it mostly works, but it is very temperamental. If I switch out of the Zwift app to change a song or read a message, there is a very good chance it will cut off the Bluetooth connection. I then have to close the app, and reload it to establish a connection. On one ride I did use Bluetooth for the trainer features, and it was disastrous with my losing connections completely within a few minutes of my ride. After poking around the app more I noticed there is a beta bluetooth function that will try and connect direct from your PC but for both my PC and laptop this would not work at all. In my case, I think Bluetooth connectivity with the phone could be due to the Mate 20 Pro and not the trainer. This was an important aspect when buying a road trainer, I something work out around 5am when I work away or am travelling. The Bkool was also excessively loud to use on some segments so even during the day it was too loud for my liking. This is completely different, it is not silent, but most of the noise seems to come from the chain movements and gear shifts. Overall, I love the Tacx Flux S, and it is one of my favourite buys of 2018. My opinion of it is largely based on the fact I got it for £400, but even at £550, it is still a great buy and the cheapest smart direct drive turbo trainer on the market. I experienced no issues with Ant+ but there is a chance that Bluetooth is less reliable and this is something worth considering if you plan to buy this. I am pretty sure most of the issues I experienced with this were due to my phone and PC plus Zwift, and not the trainer itself. While £550 is still quite a lot of money, that’s more than half the price of my bike, I still think it is a great investment, it has allowed me to move away from gym bikes and maintain my outdoor performance during the winter months. Things like Zwift have made a considerable difference to my training, in the gym I tend to do just an hour on the bike maximum and I do push myself quite hard, but with Zwift and KOMs I have found myself pushing myself harder and for longer.